LEDs don't require periodic bulb replacement like incandescent and are virtually indestructible. Stream lights revolutionary C4 technology combined with an innovative Stream light-engineered reflector provides sharp, focused light that rivals incandescent intensity without giving up the durability and longevity of an LED. Since LEDs have a long life and won't burn out or won't break, they never need to be replaced. Your light will always be ready when you need it. More powerful and more economical, Streamlight rechargeable LED lighting tools pack a lot more power with ultra-bright white beams and long illumination times. They are extremely dependable and cost-efficient. A hands-free working situation is much more productive, not to mention safer. No need to juggle while you work to complete a task with one hand while holding your flashlight in the other. Hands-free lighting tools are used wherever there is a need to use both hands (i.e. automotive, utility, electrical, firefighting, confined space or maintenance activities, among other situations). The Knucklehead features a removable magnet and stow able hook to ensure a safer, hands-free, more productive workplace by allowing the user to attach it to a metal surface (such as the hood of a car, or hang it to use as a drop light) It can also stand on its own or be laid on its side and with a 210° articulating head that rotates 360° you can direct the light where you need it. 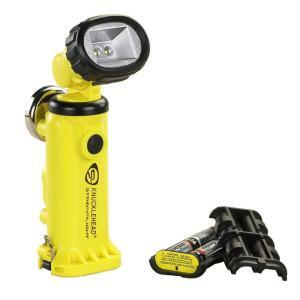 Tbook.com crawls the web to find the best prices and availability on Flashlights and related Tools and Hardware products like Streamlight Knucklehead Yellow Alkaline Model Flashlight. For this page, related items include products we find that match the following keywords: "Flashlight" at our vendor partner Home Depot. Streamlight Knucklehead Yellow Alkaline Model Flashlight is one of 152 Flashlights and related products listed in the Tools and Hardware section of Tbook.com If you have any questions on this product, please give us a call at 734-971-1210 during the hours of 9am - 5pm EST for assistance. Thank you for shopping at Tbook.com, the Internet Department Store!